Although Lily Pad doesn’t officially bloom until April 1, 2011, you’ll be able to see a new sneak peek every day until then. And you’ll definitely want to drop by because there are three prize packages with a total retail value of over $800!!! Go here for specific prize details and contest rules. Thanks for stopping by! The next stop on the hop is the fabulous and talented Tiffany. If you hit a bad link, you can always come back here and click on the next link in the hop. Please report any bad links to webmaster@inlinkz.com. Lovely welcoming card! Love the tag on a card design! So glad to be part of the DT with you! Sweet....know what I like the best? The "I missed you". So thrilled to be on the same team with you again!! Such an adorable card! Thank you Lucy for being a part of this!!! Such a cute little house - great card, Lucy! Such a cute card..love the details..as always your cards are simply fabulous!! Love the tag and the sewing! Great card! 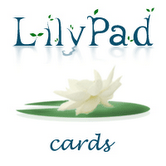 congrats on being on the Lily Pad team! SOOOO cute Love your Bright cheery Fun Card Lucy!! Love it, Lucy! Fabulous color combo. . . .love that bright lime green! Love it! I have these same house stickers!!!! Lovely Welcome card Lucy. Gorgeous color combo.TFS. This is so pretty! love the kraft and little twine bow. Very nice and "welcoming" card!!! As always, you are AMAZING! Love this card. love this green, so nice card ! This is such a SPRING card!!! Love it! Gorgeous Spring-y green! What a charming design and a special welcome! So happy to be hanging out at the Lily Pad with you! CUTE!! Love the bright colors and design! Perfect card for the hop, Lucy! Very cute, love the colors you used! all of your cards are simply outstanding...love them all. Love the tag on this and great colors. What a sweet warm welcome, Lucy! Love your work and your blog. This is such a... well adorable card! Love the colors, and design. I'm loving those bright, springy colors! Love the cheerful Welcome! So darned cute! Lucy, love your welcome home card - so adorable. Off to hop! Congrats on your followers and visits. Not surprising given the amazing inspiration to be found here on a daily basis. Hugs to you. You really make that green an yellow shine, such a sweet card! And always the most effective use of stickers, I've never seen anyone use stickers as well as you do! I love the tag on a card. So cute. I love that house on the tag - great welcome card! Such a great card Lucy - cute little house! What a sweet welcome card, Lucy - I love your cute tag! Beautiful stitching too! This is so much fun. Great inspiration! it is always lovely to stop in here because your cards just never disappoint! thanks, as always, for sharing. Muito lindo seu cartão! Parabéns! I adore tag cards. Yours is SO VERY lovely. Love the background paper and your choice of colors and ribbon. Great project! I love that tag as the focal point. And the colors make the card pop. Love the yellow and green,and tag .It really pops! I just love your card. TFS. Very cute card Lucy, so creative!! So enjoying this, again, lovely card!!! Great card - I love little houses too! Thanks for sharing this super cute card!! Congrats on your DT slot Lucy and lve this cute card. I am so excited about the big day! Can't wait to see Lily Pad in action! ADORABLE card Lucy!!! LOVE it!! Sweet card! The tag on a card is a great idea. I love love love the look and design of your card! I love the cosy little house on your tag Lucy. Yellow and green, feels like Spring!! I love the spring colours and cute little house! Margaret K.
This is so cute, Lucy! Love the bright green with the browns and all the textures :) I see you are at 1,000 followers. I love your work and style and just had to push you over the edge :) Going to be a follower - Thanks for all the wonderful inspiration! Great card..love the use of the tag.TFS! So beautifull, I totally love the colours and tag design. Such a cute welcome card! Congratulations on hitting the 1,000 followers mark, Lucy! Love your blog! Very nice welcome card. Like the tag design! ohhh, I love it! I love the kraft tag! I love all your cards! I check your blog every day! So very cute--and someone would love to get that after being away on a trip. What a cute card...love the green! So bright and cheerful, thanks for sharing it with us! 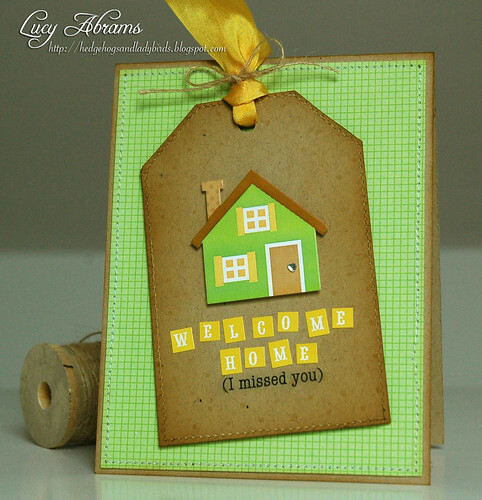 What a sweet welcome card with the fun tag and the grid background - love it, Lucy! Awesome card Lucy! Always enjoy your custom sentiments! This is a very cute card.... and I really love the tag! Such a lovely card. Always love your style and color. Fabulous card--love the tag and the green paper you used. Super cute and so quick to throw together. Awesome card. Love it. Thanks for sharing. This is such a neat card! Off to hop! So adorable,Lucy! I love it so much! Totally cute welcome home card! wow, that's a gorgeous card... I wish I could have that ...so cozy! Lovely card! I love the graph PP, and the paper piecing of the house. Super CUTE! Love the tag on the card front. Great card love the house and the way the letters were done. Great colors. Oh, these colors make for a really cute card! cute card, thanks for sharing and being a part of the welcoming hop. love your card Lucy - it is so cute! so cute! sweet card, Lucy! I love the way you have a tag on your card! What a wonderful card -- I just love the sentiment! What a sweet card, Lucy! Your sentiment is so touching! Just a lovely card Lucy. So pleased for you to be part of this exciting new site. I love your card! Very cute! O that is so sweet love the green and yellows. Lucy what a sweet card...and I love the colors you choose...so spring-like! The little cut out letters for the sentiment are really cute. A lovely bright fresh card! i love the lime green! great design lucy! LOVE your cards! SO CUTE!!! Very cute! thanks for sharing this idea! Great card Lucy! I love the tag on the front! That is cute! I love the clean, fresh look.